Posted By:Unknown | At:6:28 AM Be the first to comment! 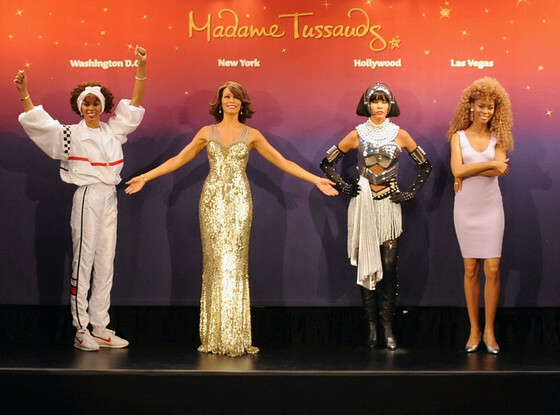 Madame Tussauds wax museum unveiled four new figures of iconic diva Whitney Houston just as the one year anniversary of her death approaches. The first wax figure features Whitney at the 1991 Super Bowl where she sang the national anthem, and will be sent to Washington, D.C. A recreation of a 2009 photo shoot from her final studio album will be on display in New York. Another figure remembers Whitney in The Bodyguard and will be put on display in Hollywood., while the fourth statue highlights her iconic look from her '80s hit "I Wanna Dance with Somebody" and is heading to Las Vegas. I still can't believe it's approaching a year since the singer has been gone. Honestly, I still can't believe she's dead.